Can Dogs eat Bread? And is Bread Dough really a dog killer? Can Dogs Eat Bread or Bread Dough? Can Dogs Eat Bread? And How About Bread Dough? Yes, dogs can eat bread, but it’s not good for them. There are several downsides that you should know about before sharing slices of bread to your canine buddy. On the other hand, a dog should NEVER be given access to raw bread dough because it can lead to very dangerous gastric problems. If your dog ate bread dough, call your vet right away! Is bread good for dogs? Bread is loaded with carbohydrates, a nutrient that is not essential for canines. Dogs thrive on a protein-based diet. While regular plain bread is not harmful to dogs, it does not have adequate nutritional value. It is also high in calories and sugar which can increase your pet’s risk for obesity. Sugar and dogs don’t go together well anyway. Many bread products use flour that contains gluten. If you know that your dog is gluten-intolerant, then you should never give even a small portion of bread to avoid adverse reactions or allergies. While wheat bread can be a source of fiber for your dog, you should never offer even a slice if he is allergic to wheat. When buying bread, you should develop the habit of checking out the ingredients for anything that is toxic or harmful to your dog. Some fancier types of bread contain add-ons such as raisins, chocolate chips, nuts, etc. which can prove to be dangerous to dogs. Some types of bread that should not be given to your dog include onion and garlic bread, raisin bread, banana bread, oat and nut bread, and moldy bread. You can give homemade bread to your dog but make sure to use gluten-free flour and limit the portions! Some owners offer bread to their dogs to ease discomfort associated with constipation or when a dog suffers from a mild, upset stomach. 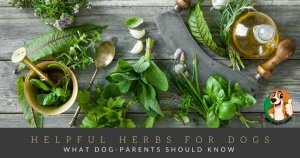 While this may help, there are far better and safer options for addressing these problems in dogs, such as a bland diet or probiotics. 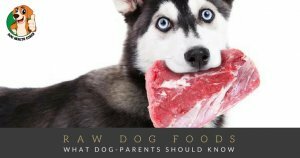 Why is Bread Dough dangerous for dogs? 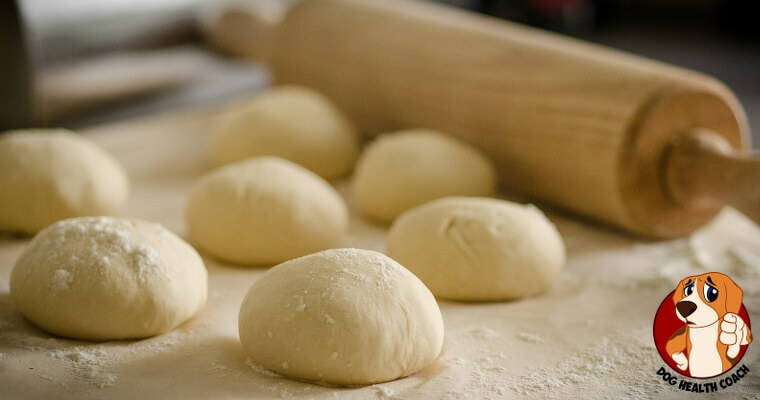 One of the ingredients used in making bread is yeast. It is needed to make the dough rise. If a dog ate bread dough, the warm environment inside the dog’s stomach will trigger the yeast enzymes to convert sugar that is in the dough to alcohol and carbon dioxide. It is carbon dioxide which can make the dough rise, while the ethanol gives the bread flavor as it evaporates during the baking process. The dough will continue to rise inside the dog’s tummy, causing it to stretch and expand, which can be very painful. As the stomach expands, it can restrict the flow of blood to the stomach wall and exert pressure on the diaphragm and other adjacent organs. In extreme cases, the stomach or intestine may rupture. The warm environment inside the dog’s stomach supports the fermentation process that can lead to an excessive buildup of alcohol, which can eventually result in ethanol toxicosis. Without prompt veterinary attention, death can ultimately follow. If you are aware that your dog has eaten dough but is not yet displaying any symptoms, sometimes making the dog vomit may be the most practical thing to do. However, this should only be done by your veterinarian because the dough can block the esophagus. If your dog is showing signs of toxicity, take him to the vet immediately. Vomiting is NEVER induced in dogs that are already showing muscle incoordination and other nervous signs. The first thing your veterinarian will do once you arrive at the clinic is to stabilize your dog. X-rays of the abdomen are then taken. A gastric tube may be inserted if there’s a lot of gas present in order to help expel the gas. Your vet may also decide to pump your dog’s stomach. Additional medications are given to address specific symptoms. Fortunately, prompt treatment and veterinary attention can increase your dog’s chances of making a full recovery.